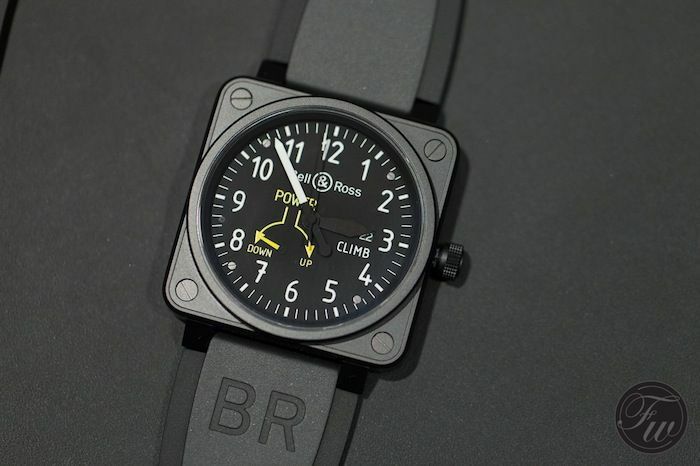 Bell & Ross and its iconic BR01 Aviation collection has a few new instruments this year: the Heading Indicator, Airspeed and Climb. Limited to 999 pieces only, although the first 99 pieces are only available in a collector’s box that also contains the BR 01 HORIZON, ALTIMETER and TURN COORDINATOR (introduced in 2012). So basically, there are 900 pieces for sale if you don’t fancy this collector’s box. The Heading Indicator piece shows the time using rotating discs. Three discs are in place, for hours, minutes and seconds. Bell & Ross made the dial look like the original heading indicator instrument, using the W, E, S and hour indicator (N) on the hour disc. The yellow plane and hour (white and yellow) indices are engraved in (or better: under) the sapphire crystal. The movement is based on the solid workhorse (since 1982) from ETA, the 2892-A2. The discs are 30 times as heavy as normal hands, so Bell & Ross had to develop new materials and methods to get it all working flawlessly. Its 46mm case is made out of stainless steel with PVD coating. Personally, we love the Airspeed best in terms of appearance! Mainly due to the use of colors and the cool lay-out of the dial. Just like the BR01 Heading Indicator, the watch has a 46mm PVD coated stainless steel case and an AR coated sapphire crystal. As always, no display back but a heavily engraved caseback instead (which we favor). Like an original airspeed indicator, where the speed in knots and Mph are graduated, Bell & Ross did a similar thing to the hours, minutes and seconds. The hours being in the center of the watch, followed by the minutes and the seconds in the outer ring of the dial. The colored ring indicates the quarter of an hour, where it normally indicates the level of criticality with regards to airspeed. The luminous dial is very colorful and it will definitely stand out on your wrist, as can be seen below. 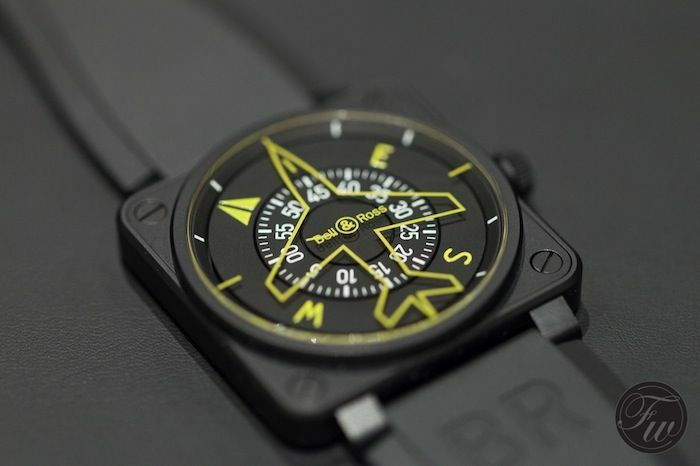 The BR01 Airspeed has an ETA2892-A2 based movement inside, just like the Heading Indicator model. 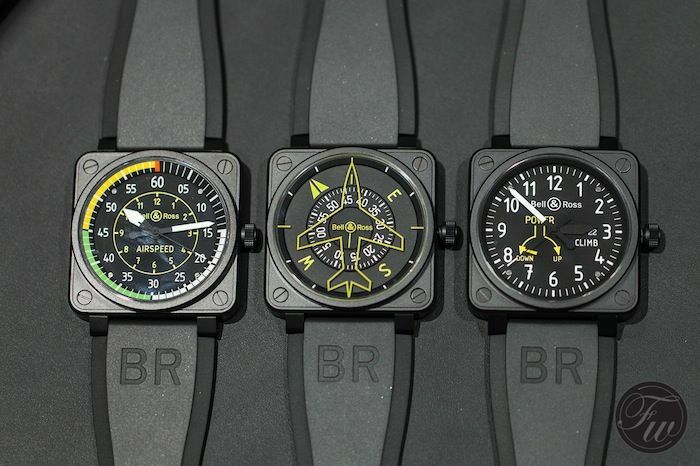 The BR01 Climb, based on the vertical speed indicator in an airplane has a different movement from the others. A movement based on the ETA2897, which features a power reserve indicator. Indicated by a Up & Down arrow, where the reference instrument (the vertical speed indicator) has an Up & Down to indicate the climb speed. 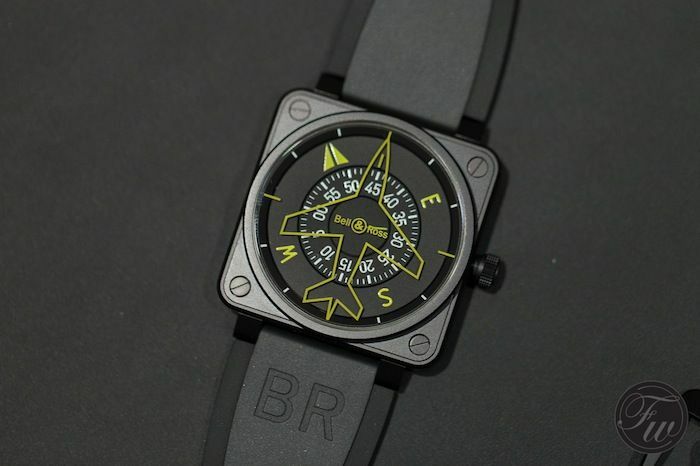 This is perhaps the most basic model of the three new BR01 Aviation models, but we are sure that there are enough Bell & Ross enthusiasts out there who will appreciate this model with its basic appearance. We do. 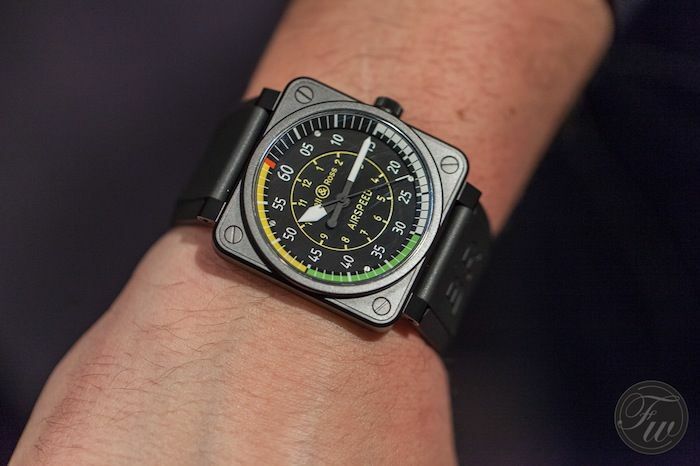 As the only one of the three, this BR01 Climb also features a date window (at 3 o’clock). We are happy to see that the date disc is black with white numerals on it. The dial keeps its nice contrast this way. 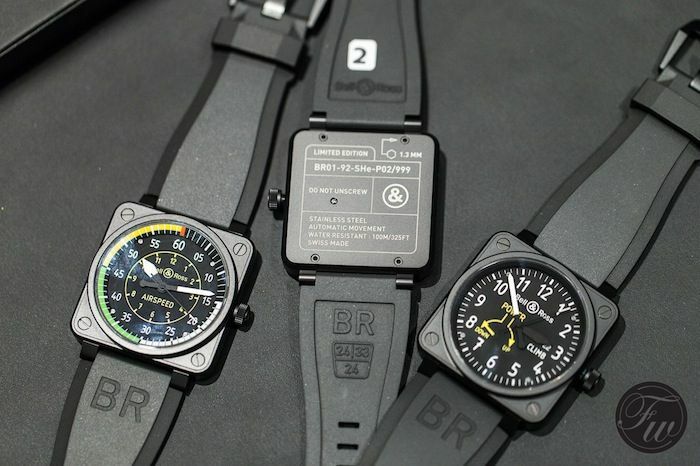 All three models have a rubber strap with BR in it. They also come with a heavy-duty synthetic fabric strap. Prices start at 3500 Euro. More information can be found at www.bellross.com.